Are you still upset about patient care? Adopt double - sided waterproof nylon fabric, Lightweight, breathable, anti - leakage design. Equipped with 8 strongly reinforced bed pad handles for easy patient transferring. Ideal for repositioning a patient in bed, wheelchair or turning. Machine washable and very easy to clean. At ZHEEYI, we believe in our products. Backed by our 100% satisfaction guarantee you have nothing to lose! If this bed pad does not meet or exceed your expectations, feel free to return it within 30 days for a full refund of your purchase! Equipped with 8 strongly reinforced bed pad handles for easy patient transferring. 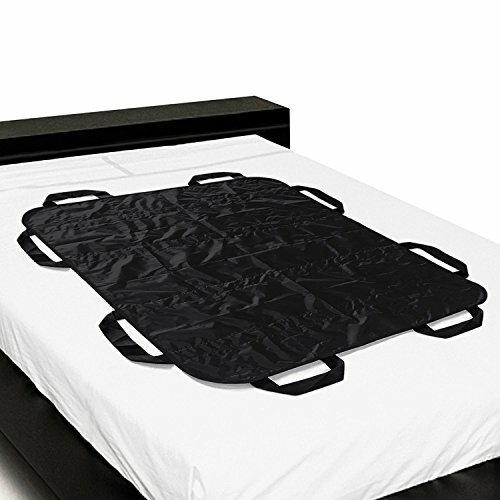 Ideal for repositioning a patient in bed, wheelchair or turning. Features: Adopt double - sided waterproof nylon fabric, Lightweight, breathable, anti - leakage design. Double-layer nylon construction for strength and durability. WASHABLE: Simply throw the pad in the wash, tumble dry, and put it back on the bed. Your pad will be ready to offer premium protection, time and time again. GET IT RISK FREE: Backed by our 100% satisfaction guarantee you have nothing to lose! If this bed pad does not meet or exceed your expectations, feel free to return it within 30 days for a full refund of your purchase! If you have any questions about this product by ZHEEYI, contact us by completing and submitting the form below. If you are looking for a specif part number, please include it with your message. North Coast Medical NC84507 Assure Safety Transfer Pivot Disc 13 in.